One side of the globe gazes stoically towards the West while the other side appears irate. Does this represent a confrontation between the East Elders of Asia and the West white supremacists? The cover features a few other symbols referring to the “rise of the East” with India, China and the Entire ASEAN and Siberia map greener; are these the area the elites want to develop even further? High tech surveillance and nuclear warfare. The Economist is not very optimistic. What’s more unsettling is that, immediately under that angry globe, are pictured a mushroom cloud (the kind that happens after a nuclear bomb goes off) and a spy satellite launching into space. Sitting right under the crop-o-dust, this kid is eating a heavily processed package of noodles. Is he ingesting the poison that was spread by the aircraft? A panda bear wearing a China-flag Speedo while flexing its muscles is a rather clear way of portraying the fact that China is gaining power. Next to it is a sumo wrestler holding a big battery on which the polarities (+ and -) are clearly indicated. Are they alluding to a switch in polarity in world power from the West to the East? Emerging from behind Obama’s leg is a ghost reading a magazine entitled “Holiday”. Why is this ghost, which represents a dead person, planning a vacation? Does it represent the fact that the masses will be so impoverished that the only time they’ll be on a holiday is when they’re dead? Does it relate to the countless people who died while traveling in the past months? Creepy. Standing in front of everything else, gazing right into our souls is a turtle with emphasis lines around its shell. What does it represent? Will turtles make a huge comeback in 2015? Probably not. An angry tortoise is the symbol of the Fabian Society, an extremely powerful organization that has been working for over a century towards to formation of a single world government. The motto of the Fabian Society is “When I strike, I strike hard”. The philosophy behind Fabian socialism is basically the blueprint of what we call today the New World Order. The Fabian Society used to openly advocate a scientifically planned society and supported eugenics by way of sterilization. Its original logo was a wolf in sheep’s clothing … But I guess that was not the best way to conceal the wolf from the masses. The original logo of the Fabian Society. Bringing forth a global system through small incremental changes is exactly what the world elite is currently doing. This is probably why there’s an angry tortoise on the cover of this Bilderberg-connected publication – standing in front of the chaos behind it. The lower right side of the cover features some more cryptic symbols. There’s a pile of dirt on the ground and two arrows on which are inscribed 11.5 and 11.3. Are those dates to remember? Why are they next to a pile of dirt? If you look up these figures as coordinates, they point to somewhere in Nigeria. Displaying numbers that can only be truly understood by “those in the know” is one of the occult elite’s favorite hobbies. Standing in front of the dirt is Alice in Wonderland looking upwards towards the Cheshire Cat. This iconic cat is known for disappearing entirely, leaving only visible its creepy grin. We therefore see another allusion to a world of fantasy, illusion and deceit as perceived by Alice – a representative of the masses. Along with the somewhat unnecessary inclusion of David Blaine – a magician – the cover mixes real world events with illusions. Other notable symbols on this cover include a piggy bank flying from James Cameron’s pockets; A model wearing an Alexander McQueen creation (the elite’s favorite designer who died in strange circumstances) and an Asian officer wearing a facemask to protect him from a deadly disease. 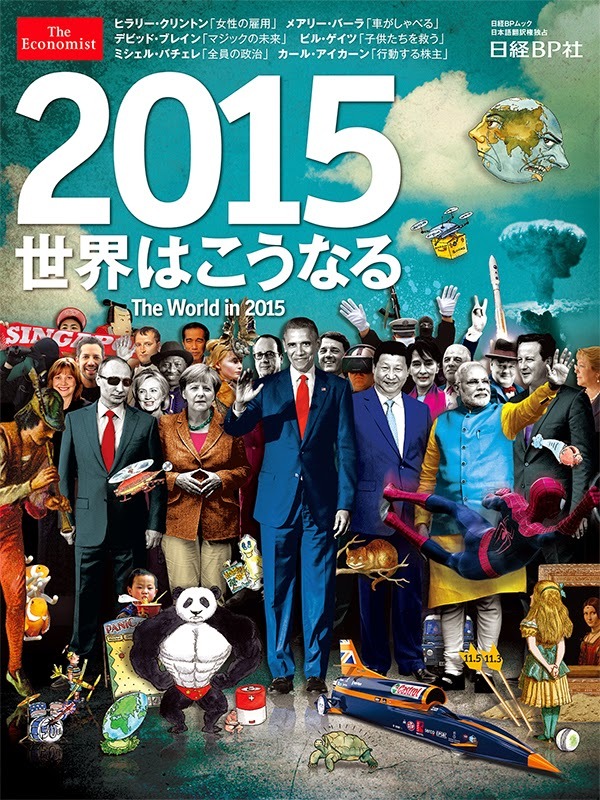 The Economist is not a random newspaper that publishes quirky 2015 predictions to sell a few additional copies. It is directly connected to those who shape global policies and who make sure that they are applied. The publication is partly owned by the Rothschild banking family of England and its editor regularly attends Bilderberg meetings. In other words, The Economist is connected to those who have the means and the power to make “predictions” a reality. The 2015-themed cover basically reflects the overall Agenda of the elite and is peppered with cryptic symbols that appear to be included for “those in the know”. And the masses, like Alice watching the Cheshire Cat disappear, will focus on illusions while the wolf in sheep’s clothing will strike … and strike hard.